Seventh grader Alexander Drewitz, who earlier placed 1st in the school-wide Scripps-sponsored Spelling Bee, has taken 3rd place in the city-wide competition. The city competition was co-sponsored by the New Orleans Chapter of The Links, Inc. and the Times-Picayune. The New Orleans Links is a chapter of a national women’s organization “committed to educational, civic, and intercultural activities. We are so proud of ALL of our 7th graders! 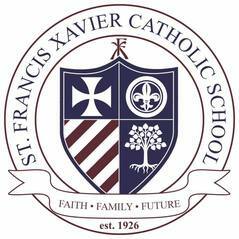 Every 7th grade student at SFX was accepted to the high school of their choice! Congratulations! Your hard work paid off! St. Francis Xavier fourth grader Lauren Buisson has taken 4th place in the city-wide Missionary Childhood Association Stamp Art competition. Seventh grader Frederick Drewitz, who earlier placed 1st in the school-wide National Geographic Geography Bee, has taken 5th place in the state-wide competition. The city competition was co-sponsored by the New Orleans Chapter of The Links, Inc. and the Times-Picayune. Academic Scholarships awarded to Reily O&apos;Leary and Fredrick Drewitz! We are beyond proud of Reilly O&apos;Leary and Frederick Drewitz, who have been awarded Archbishop Joseph Rummel Scholarships! Congratulations Kathy Calder! We are truly blessed to have such a fun, outstanding and creative yearbook adviser! Thank you for sharing your time and talent! On September 30, members of the Archdiocese’s Conference of the St. Vincent de Paul Society sponsored their 10th annual Walk/Run for the Poor. Hundreds of people turned out in City Park on the beautiful morning to make the mile-long event. The St. Francis Xavier School’s Young Vincentians were acknowledged by the Brown Foundation recently, and given a grant of $4,380 for their service projects which include helping the St. Vincent de Paul Pharmacy and their Learning Center.